A revolutionary government or provisional government has been declared a number of times in the Philippines by insurgent groups. The First Philippine Republic was under a revolutionary government. A revolutionary government was declared by the Katipunan during the Philippine Revolution or the War for Independence of the Philippines against the Spanish colonial administration over the islands. The Tejeros Convention of 1897 saw the election of officers for a revolutionary government. The independence of the Philippines from Spain was declared by Katipunan leader, Emilio Aguinaldo, who is recognized as the first President of the country, on June 12, 1898. Six days later a revolutionary government over the Philippines was officially declared. President Corazon Aquino declared a revolutionary government following the People Power Revolution. 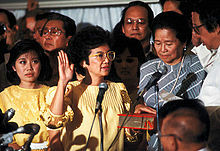 Following the fall of the authoritarian administration of President Ferdinand Marcos due to the People Power Revolution of February 1986, Marcos' successor, President Corazon Aquino established a revolutionary government with the signing of the "Freedom Constitution" by the virtue of Proclamation No. 3, which established human rights as the core of Philippine democracy. In October 13, 2017, Rodrigo Duterte threatened the opposition that he shall declare a de facto authoritarian government through a revolutionary government that will hinder liberalism in the Philippines. He cited the revolutionary government of Corazon Aquino, however, experts disagree with his citing of Aquino's People Power Revolution as the 1986 revolution was initiated by the people of the Philippines, and not by an incumbent president. The opposition criticized Duterte's statements, stating that his revolutionary government will be another martial law age in the Philippines. He has threatened communist rebels of arrest and a full-scale war against the CPP–NPA–NDF once a revolutionary government that would last until the end of his term was declared. Though by November 2017, Duterte has dropped the idea saying that he doesn't need to declare a revolutionary government in order to arrest communist rebels. ^ Renato Constantino and others wrote that the Katipunan served as a shadow government. On March 23, 1901, United States forces captured Emilio Aguinaldo, President of that government. On April 1, 1901, Aguinaldo swore an oath accepting the authority of the United States over the Philippines and pledging his allegiance to the American government. On April 19, 1901, Aguinaldo issued a Proclamation of Formal Surrender to the United States. On July 4, 1902, United States president Theodore Roosevelt proclaimed an amnesty to those who had participated in the conflict. On April 9, 2002, Philippine President Gloria Macapagal Arroyo proclaimed that the Philippine–American War had ended on April 16, 1902 with the surrender of General Miguel Malvar. ^ a b Tomacruz, Sofia (25 November 2017). "When did the Philippines have a revolutionary government?". Rappler. Retrieved 1 December 2017. ^ Borromeo & Borromeo-Buehler 1998, p. 25 (Item 3 in the list, referring to Note 41 at p. 61, ^ Borromeo & Borromeo-Buehler 1998, p. 135 (in "Document G", Account of Mr. Briccio Brigado Pantas). ^ Severino, Howie (November 27, 2007), Bonifacio for (first) president, GMA News . ^ a b c Philippine History Module-based Learning I' 2002 Ed. Rex Bookstore, Inc. p. 162. ISBN 978-971-23-3449-8. ^ a b Salaverria, Leila (13 August 2017). "Duterte threatens to adopt Cory's revolutionary style gov't vs destab plotters". Philippine Daily Inquirer. Retrieved 2 December 2017. ^ Romero, Alexis (22 November 2017). "Duterte nixes idea of a revolutionary government". The Philippine Star. Retrieved 2 December 2017. Borromeo, Soledad Masangkay; Borromeo-Buehler, Soledad (1998), The cry of Balintawak: a contrived controversy : a textual analysis with appended documents, Ateneo de Manila University Press, ISBN 978-971-550-278-8. Constantino, Renato (1975), The Philippines: A Past Revisited, ISBN 971-8958-00-2. Halili, Christine N; Halili, Maria Christine (2004), Philippine History, Rex Bookstore, Inc., ISBN 978-971-23-3934-9.